Joiner that merges sorted data from two or more data sources on a common key whose values must differ in these data sources. RelationalJoin does not propagate metadata. RelationalJoin has no metadata template. RelationalJoin receives data through two input ports, each of which may have a distinct metadata structure. Defines the way of joining driver (master) and slave records. See Join relation. The type of a join. See Join Types. This is a joiner usable in situations when data records with different field values should be joined. It requires the input to be sorted and is very fast as it is processed in memory. The data attached to the first input port is called the master as it is also in the other Joiners. The other connected input port is called slave. Each master record is matched to all slave records on one or more fields known as a join key. The slave records whose values of this join key do not equal to their slave counterparts are joined together with such slaves. The output is produced by applying a transformation that maps joined inputs to the output. All slave input data is stored in memory; however, the master data is not. Therefore you only need to consider the size of your slave data for memory requirements. 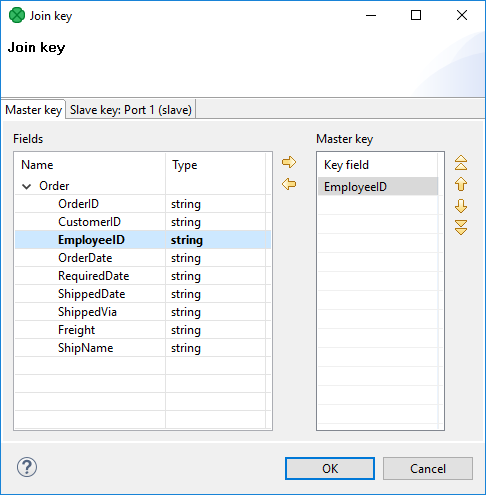 You must define the key that should be used to join the records (Join key).¨The records on the input ports must be sorted according to the corresponding parts of the Join key attribute. You can define the Join key in the Join key wizard. The Join key attribute is a sequence of individual key expressions for the master and all of the slaves separated from each other by a hash. Order of these expressions must correspond to the order of the input ports starting with a master and continuing with slaves. Driver (master) key is a sequence of driver (master) field names (each of them should be preceded by a dollar sign) separated by a colon, semicolon or pipe. Each slave key is a sequence of slave field names (each of them should be preceded by a dollar sign) separated by a colon, semicolon, or pipe. You can use this Join key wizard. When you click the Join key attribute row, a button appears there. By clicking this button you can open the mentioned wizard. In it, you can see the tab for the driver (Master key tab) and the tabs for all of the slave input ports (Slave key tabs). In the driver tab, there are two panes. The Fields pane on the left and the Master key pane on the right. You need to select the driver expression by selecting the fields in the Fields pane on the left and moving them to the Master key pane on the right with the help of the Right arrow button. 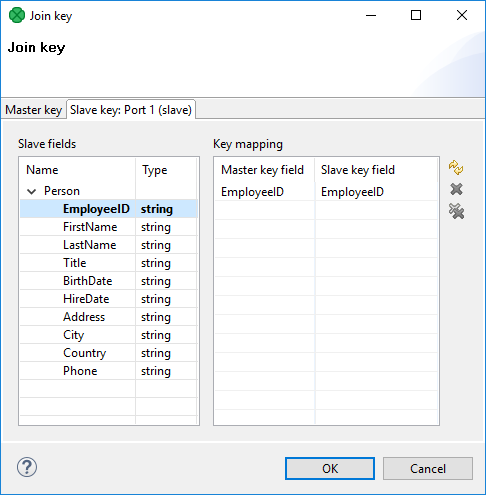 To the selected Master key fields, the same number of fields should be mapped within each slave. Thus, the number of key fields is the same for all input ports (both the master and each slave). In addition, driver (Master) key must be common for all slaves. In each of the slave tab(s) there are two panes. The Fields pane on the left and the Key mapping pane on the right. In the left pane you can see the list of the slave field names. In the right pane you can see two columns: Master key field and Slave key field. The left column contains the selected field names of the driver input port. If you want to map a driver field to slave field, select the slave field in the left pane by clicking its item, push the left mouse button, drag to the Slave key field column in the right pane and release the button. The same must be done for each slave. Note that you can also use the Auto mapping button or other buttons in each tab. If both input ports receive data records that are sorted in descending order, slave data records that are greater than or equal to the driver (master) data records are the only ones that are joined with driver data records and sent out through the output port. Corresponding Join relation is one of the following two: master(D) < slave (D) (slaves are greater than master) or master(D) <= slave(D) (slaves are greater than or equal to master). If both input ports receive data records that are sorted in ascending order, slave data records that are less than or equal to the driver (master) data records are the only ones that are joined with driver data records and sent out through the output port. Corresponding Join relation is one of the following two: master(A) > slave (A) (slaves are less than driver) or master(A) >= slave(A) (slaves are less than or equal to driver). If both input ports receive data records that are unsorted, slave data records that differ from the driver (master) data records are the only ones that are joined with driver data records and sent out through the output port. Corresponding Join relation is the following: master != slave (slaves are different from driver). Any other combination of sorted order and Join relation causes the graph fail. When you define your join attributes, you must specify a transformation that maps fields from input data sources to the output. This can be done using the Transformations tab of the Transform Editor. However, you may find that you are unable to specify more advanced transformations using this easiest approach. In such a case, you need to use CTL scripting.